Which player (Black or White) is moral? Which place has the most score estimators (SE)? The go master is playing online go with extreme precision. He always moves the mouse pointer to his desired move via the shortest path. Find the expectation of the total length of the trajectory of the mouse pointer per game. 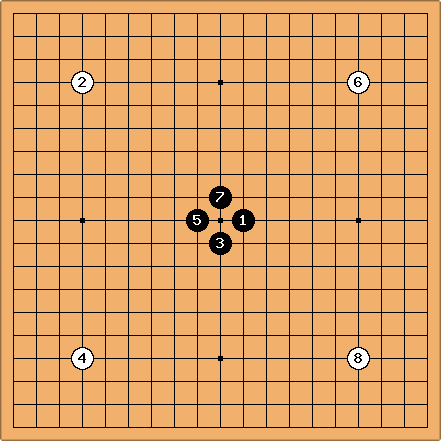 The go master is playing 361 even simuls on a 19x19 square grid (from (1,1) to (19,19)) of 19x19 go boards, all as White. He starts at board (1,1), denoted B(1,1). When his opponent plays a move at (x,y), he responds and moves over to B(x,y). The process repeats until he lands at a board where the game is already over and his opponent is able to pass twice. (To finish as many games as he can, the go master can play threats inside his opponent's territory even when the game is technically over. At this stage, he is not allowed to fill his own territory or common liberties in seki.) Resignation is not allowed. Find the expectation of the fraction of games he can finish (out of the 361 games in total). Find the expectation of the total distance traveled by the go master. The go master carries with him a bag of white stones. To minimize burden (and cost for the sponsor of this event), how many stones are sufficient with 95% confidence? The go master is trying to understand to what extent a player follows the other around. Find the probability distribution of the distance between two consecutive moves. In general, for a consecutive sequence of N moves, find the probability distribution that these moves are bounded within a circle of radius R. We shall denote such a cluster as C(N,R). As a function of N and R, find the expectation of the number of C(N,R) clusters per game. The go master defines the height h of a stone as the distance to the nearest edge, plus 1. For example, a 1st-line stone has height h=1; tengen has height h=10. In territory scoring, one's score is simply the total number of all living stones, or Sum (h^d), where d=0. If the exponent d were chosen to be 1, 1st-line stones would still be 1 point, but tengen would count as 10 points. What is the smallest value of d (need not be integer) such that h>4 for all the first 50 moves, with a 95% confidence level. 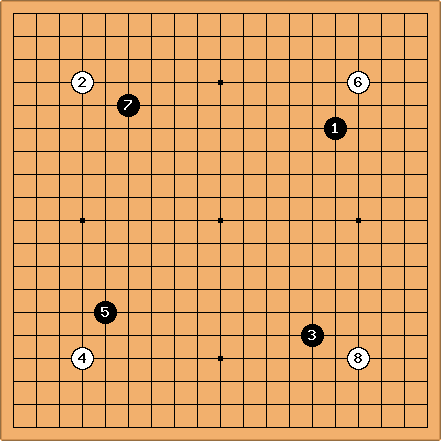 The go master is playing go in the following manner. For every move (x,y), a sub-game is played on another board such that the player plays the current main-game move as the first move in the sub-game. The value of the stone at (x,y) in the main game is assigned as the score difference between the two players in the sub-game. Find the expectation of the score difference in the main game. There is no komi. Find the expectation of the score difference in the main game when the process is also applied to all sub-games of the main game (but not sub-sub-games). 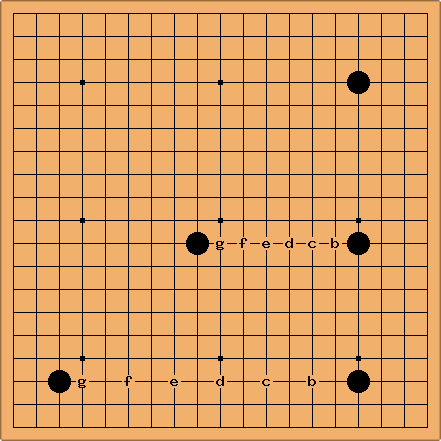 The go master claims that he can make a living group on a 19x19 board even if his opponent gets to play 2 moves every turn (sequentially, so that a group with 2 eyes is alive). Find the smallest board size such that his claim holds. What if his opponent plays 2 moves simultaneously (so that 3 eyes are needed to live)? The go master discovers that only empty triangles exist on a 2x2 go board. Being fascinated by the beauty of equilateral triangles, he wants to find one on a go board. Show that the go master is bound to fail on any square board. Find the best approximate equilateral triangle on a 19x19 board by minimizing the sum of the absolute error in the interior angles (i.e., |alpha-60|+|beta-60|+|gamma-60|). For an NxN board, where N>=2, denote the sum of the absolute error in the interior angles of the best approximate equilateral triangle as e(N). How fast does e(N) decay with N? The go master agrees with the saying, "don't put all your eggs in one basket." On the other hand, it appears that only Sakata Eio can manage 7 groups, and that having 8 or more groups is unfeasible. What is the optimal number of groups to maximize one's winning probability? This game was played against Jin Jing 2p using another account. I took 4 stones. I believe this is my second victory against professionals -- the first time was an 8-stone game many years ago. I play a lot against computers on KGS. They are unorthodox but creative and very sensitive to the global balance. rsun-Zen19S: Zen likes to start with hoshi and often makes the sanrensei formation. Given its preference for moyo and the significant komi (7.5), it is natural for White to adopt a territorial strategy in the beginning. As it is usually the case, the question is how to reduce its moyo effectively. Zen19S-rsun: In this game I decided to use Zen's favorite opening, the sanrensei. Zen made a terrible mistake in handling my corner invasion and could never turn the tables. As the title misleads, these are not studies at all. Just for fun. Inspired by the Shusaku fuseki, I have invented the spiral-n opening, where n is the smallest number of the coordinates of the black stones. 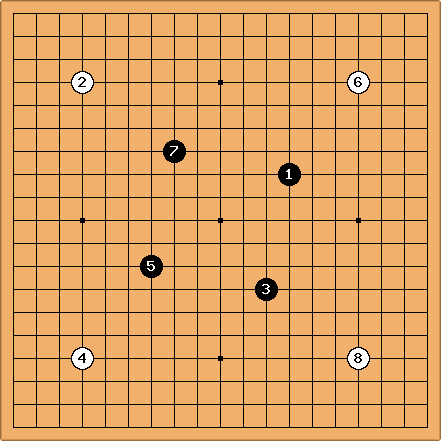 Hence the opening moves of the Shusaku fuseki can be classified as (an incomplete) spiral-3. However, such an opening will almost never come to completion, as white will almost always play at an empty corner. For the same reason, spiral-4 (d) will also never be realized. It is obvious that spiral-1 and spiral-2 are bad and should be rejected outright. Note that spiral-9 (i) forms a cyclic kosumi (i.e., an eye) and spiral-8 (h) is a cyclic ogeima. 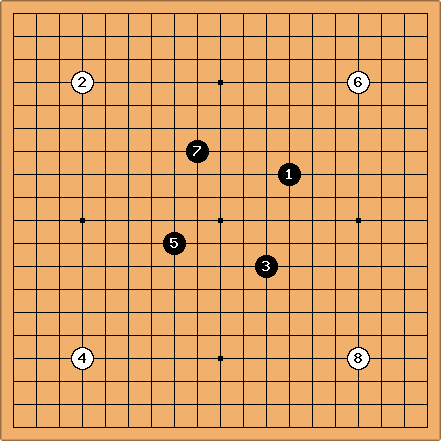 The spiral-9 opening may be discussed in beginner go books. As the saying goes, a ponnuki at tengen is worth 30 points. 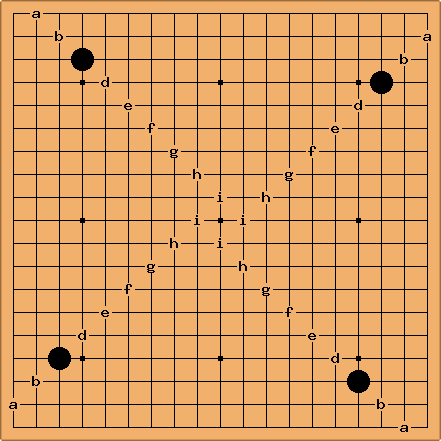 However, as White gets four corners without sacrificing a stone, this opening is too inefficient for Black. Likewise, spiral-8 may be inefficient as well. Observe the trend as n increases. For n=1,2, the openings are bad. For n=3,4, the openings become acceptable, but completing it becomes bad, as Black blindly attaches into White's corners. For n=8,9, the openings become inefficient. If you believe, as I do, that the strength of the spiral-n opening increases for low n and decreases for high n, then by (improper use of) Rolle's Theorem, there must exist an optimum n where the spiral-n opening is the strongest. Unfortunately, this optimum n cannot be found analytically. Based on intuition, it seems to me that the spiral-6,7 openings should be the best. The spiral-7 opening radiates strong influence toward the entire board. Compared to spiral-7, the spiral-6 opening puts more pressure on White's corners. The spiral-5 opening has 4 unusual kakaris. However, it is very likely that White will respond locally and Black may not be able to complete the formation. The cyclic daidaigeima opening, as the name suggests, contains 4 daidageimas, forming a relatively solid shape. However, it cannot be classified as a spiral-n opening. It is clear that a spiral-n opening is composed of 2*(9-n)-space extensions. Thus, odd-space extensions cannot be spiral-n. It may still be too slow. Although spiral-n has a 4-fold rotational symmetry about tengen, mirror symmetry is spontaneously broken. Hence, Black's 5th move is greatly influenced by the symmetry of White's first 4 moves. One must never use the spiral-n opening to defend the tengen territory. That completely misses the point. Instead, one should overplay reasonably (an oxymoron?) at sides and corners to provoke fights, so that the first 4 moves can become effective. Of course, there is always the possibility that black cannot complete the formation due to an existing white stone. However, Black should not feel that s/he is at a disadvantage. Vertical and diagonal Chinese opening. Other possibilities marked b-g. 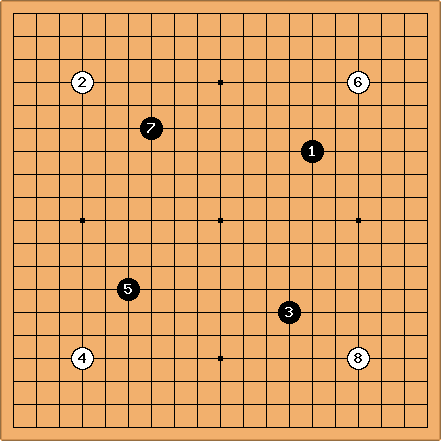 Note that Go Seigen once played 3-3, 4-4, 10-10, whereas the diagonal Chinese fuseki is 3-3, 4-4, 9-9. Ko; it is not ok.